CHARLESTON, W.Va. – West Virginia enrolls a greater percentage of its four-year-olds in state-funded preschool than all but two other states, according to the annual survey of state-funded preschool programs. 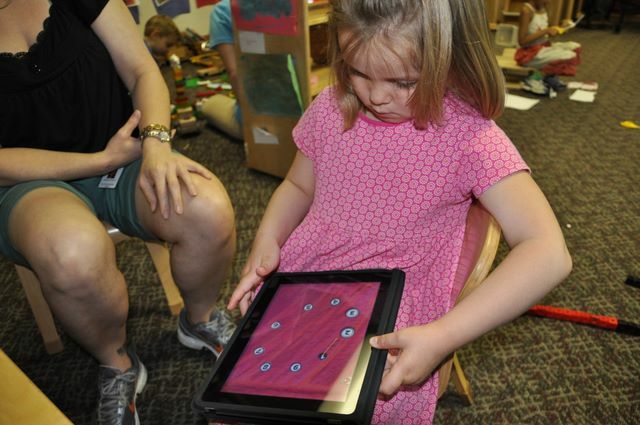 View a slideshow of a visit to Marshall University's Pre-K program. The State of Preschool 2010, released Tuesday, showed that West Virginia ranked third nationally for the percentage of 4-year-olds enrolled in pre-K, stepping up two notches from the previous year. West Virginia also ranked in the top 10 for percentage of 3-year-olds enrolled in state-funded preschool. In addition, the state ranked 10th in the nation in terms of spending per child in pre-K, moving up from 13th last year. West Virginia’s pre-K program met eight of 10 quality standards benchmarks, gaining one benchmark over the previous year as the provision of meals is now one of the standards. “All indications point to West Virginia keeping on schedule as it marches toward universal access to pre-K in 2013,” said W. Steven Barnett, co-director of the National Institute for Early Education Research (NIEER) and author of the survey. In working toward universal access, West Virginia counties are required to share their plans for expanding preschool access with the state each year. Since July 2004, only 3-year-olds who have an Individualized Education Plan (IEP) can receive state funding for preschool. Public schools receive funding for the West Virginia Universal Pre-K System directly, though these schools may subcontract with other agencies to provide services. Half of the programs are required to operate in collaborative settings with Head Start agencies, child care centers and private prekindergarten centers to facilitate expansion of the pre-K program. The state revised its funding calculations in the 2008-2009 school year so full-time equivalency is now based on the hours of instruction for all children, regardless of location. As a result, more children are enrolled in full-day programs throughout the state. In 2009, the West Virginia Board of education made policy revisions to require meals, regardless of the hours of instruction, and to establish a process for phasing in a requirement for lead teachers in community partnerships to have a bachelor’s degree. In 2010, the policy was revised to update and align the early learning standards with kindergarten content standards and objectives as well as to address school readiness and assessment. For more information, contact the WVDE Communications Office at (304) 558-2699.